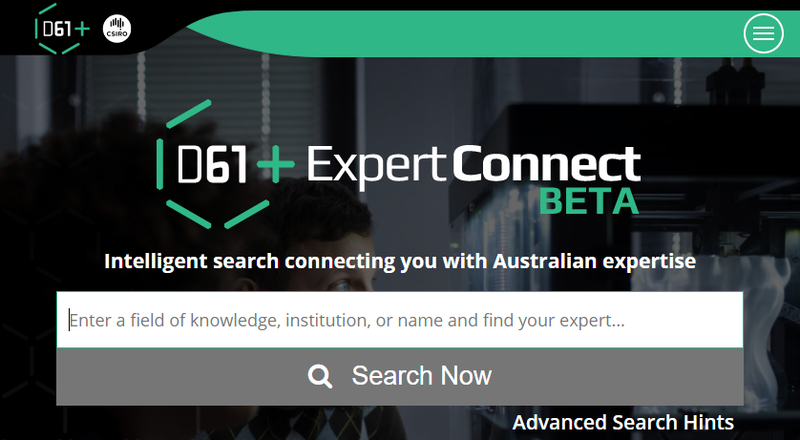 Data61’s Expert Connect is designed to boost industry-researcher collaboration by creating a publicly searchable database of Australia’s research expertise. Profiles for over 45,000 researchers from over 200 research organisations have been automatically created by drawing on data from IP Australia, ARC, NHMRC, Web of Science and The Conversation. Any business person can search for a topic of interest (using simple, non-scientific language) and find the most relevant researchers to connect with. Leverage existing platforms & datasets: this is already a very crowded space (with over 30 platforms servicing part of this connection need). Leveraging what already exists, Expert Connect draws together the following: IP Australia patent information, ARC/NHMRC grant information, Web of Science journal information, and The Conversation author profiles and articles. The key is that the drawing together of this data is ongoing and automatic, each new piece of data gets added to the relevant profile without manual intervention. So no one needs to create or maintain their profile. Platform is not a silver bullet: a new platform is not going to solve everything, there are also issues around incentive structures, different language, processes, timeframes etc., that will still act as barriers. However Expert Connect should streamline and support the expertise search process, serving as a useful tool for those who play an important role in facilitating industry-researcher linkages. Multiple access points: connections will happen in a variety of ways, rather than focusing only on trying to encourage people to come to a new platform, the information will also be pushed out to the places that people are already going. Hence Data61 is making Expert Connect available via API so that any organisation can showcase Australia’s research expertise on their own platforms. They may choose to display the full list, or only a relevant subset (such as experts in a particular industry or geographic location). Done is better than perfect: the current iteration of the platform is a beta version, with work occurring daily to enhance the data matching and add functionality. Whilst this does mean that researcher details may not be 100% correct yet, the good news is we’re open to suggestions regarding how to shape the platform moving forward. To get involved in any of the above, or to provide feedback/suggestions, please contact ExpertConnect[@]csiro.au. A series of FAQs are also available on the website. CSIRO’s Data61 is Australia’s leading data innovation group which was officially formed in 2016 from the integration of CSIRO’s Digital Productivity flagship and the National ICT Australia Ltd (NICTA). Our mission is to create Australia’s data-driven future. This post first appeared on LinkedIn at https://www.linkedin.com/pulse/data-driven-industry-researcher-connections-zoe-piper/.